Radiographers are often on the front lines of injuries and illnesses, and they are instrumental in working with physicians to find a diagnosis. The Associate of Applied Science in Radiography prepares men and women from culturally and ethnically diverse communities for a career as professional radiographers. Graduates are trained to capture the highest quality medical images as they relate to patient conditions. The program exposes students to rich clinical experiences, building on the theoretical foundation received in the classroom. Radiographers use radiation equipment to produce images of the tissues, organs, bones and vessels of the body, to assist physicians in the diagnosis of disease or injury. Radiographers continually strive to provide quality patient care and are particularly concerned with limiting radiation exposure to patients, themselves and others. Radiographers use problem-solving and critical thinking skills to perform medical imaging procedures by adapting variable technical parameters of the procedure to the condition of the patient. Radiographers apply knowledge of anatomy, physiology, biology, positioning, and radiographic technique when performing their responsibilities. Most importantly, they must be able to communicate effectively with patients, other health professionals, and the public. The Associate of Applied Science in Radiography curriculum includes 54 radiography semester hours as well as 23 general education semester hours. General education courses promote the practice of oral and written communication skills, the use of mathematics, and utilization of human and social awareness that promote reflective thinking and problem-solving. Application of general education knowledge is an expectation for today's health care graduates. The Trinity College curriculum prepares graduates to practice as entry-level professional radiographers. Students acquire and manipulate computer images and work with some of the most technologically-advanced equipment in the medical field. Students learn how to communicate with patients, solve problems and work with other members of the health care team. Emphasis is placed on developing skills that allow students to provide culturally congruent patient care that is sensitive as well as compassionate. Students are assigned clinical experiences using the facilities of Trinity Regional Health System and also health institutions within the community. 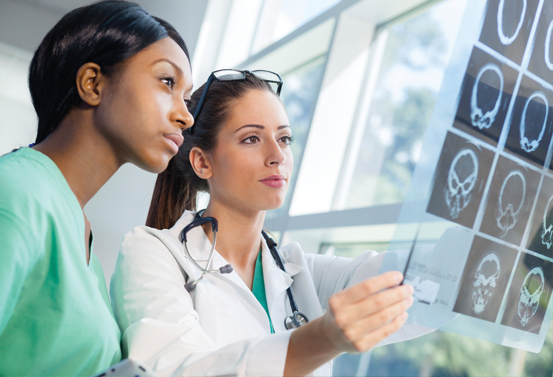 The Radiography Program requires that all graduates demonstrate competency in didactic coursework and a specified list of clinical competencies to include those mandated by the American Registry of Radiologic Technologists (ARRT). Salary information is being provided for general information only. Trinity makes no representations regarding specific starting salaries that prospective and current student may obtain post-graduation.